An indoor-outdoor connection between your house and garden is always pleasing. 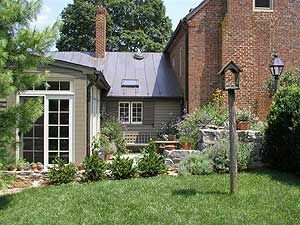 A landscape designer can prepare plans for decks, patios and walkways. As you try to visualize the space needed, a minimum patio or deck size is about 5 feet by 6 feet and al lows two people to relax at a small table. For multi-purpose decks and patios, allow about 64 square feet per person and the square footage can be broken up into several pieces to be used by all. Also, consider what type and size of outdoor furniture will be placed the deck or patio area. Gates and paths should be a minimum of 3 feet in width. Smaller gardens or service paths can be narrower. Tips on perspective, a deck constructed with wide boards makes an area appear smaller. And a deck built with narrow thin boards makes the space appear larger.